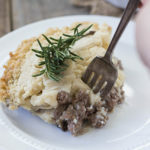 Tourtiere is a French Canadian meat pie dish, and one that was a staple of my childhood. There are regional recipes (and much debate over which versions are the most authentic), but they are generally made with a mince of pork or veal with potatoes, mirepoix and simple seasonings (my mom used bay leaves, rosemary, thyme, and/or savory in hers). 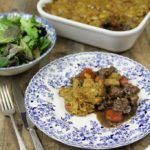 My mom’s tourtiere was the basis for my Tourtière-Inspired Shepherd’s Pie recipe. So, what’s the deal with salmon? To be honest, I didn’t realize that salmon tourtiere was a thing until I was scouring the internet for ideas on how to best use some leftover steelhead trout I had in my fridge. 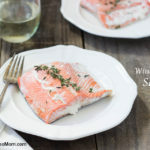 And, what I discovered was inspiring: while you can certainly use hot-smoked; freshly steamed, baked or poached; or leftover salmon or trout for this dish, it’s actually most commonly a way to spruce up some canned salmon! The idea of turning inexpensive, nutrient-dense (bones and all!) 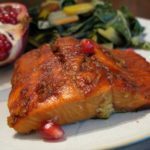 canned salmon into a warm, comforting and delicious meal inspired my creativity in the kitchen! 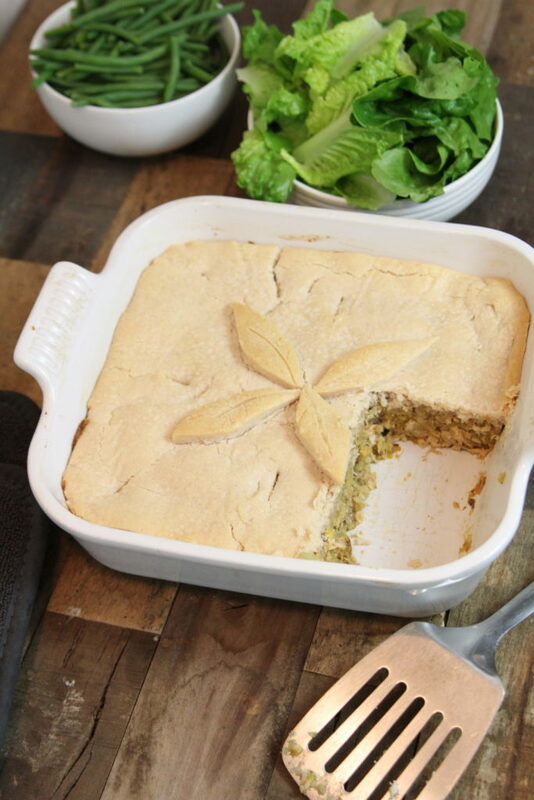 And, move over tuna casserole, this dish is packed with nutrition and my whole family loves it! 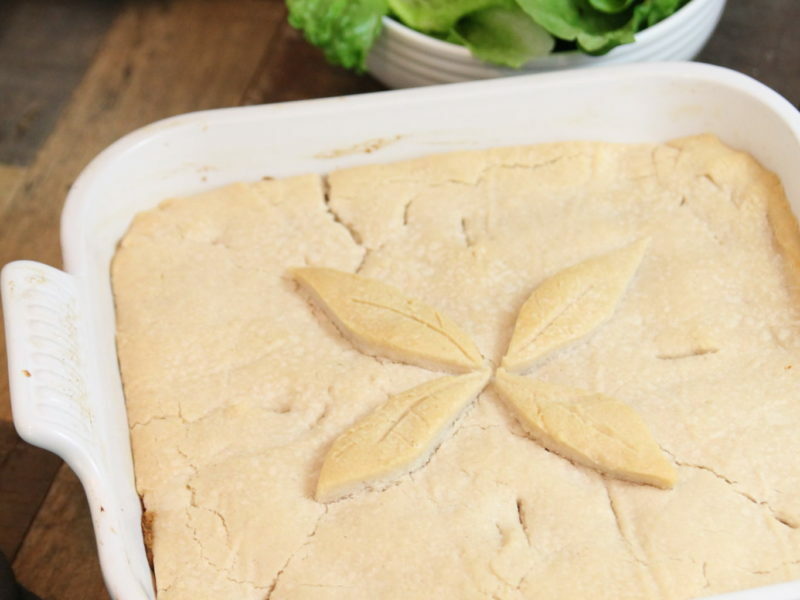 You can make it as a meat pie (double crust) or as a pot pie (as shown). Oh, and did I mention that it’s AIP?!?!?! Yeah, that happened too! 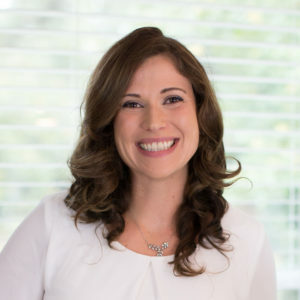 I recommend wild-caught salmon in BPA-free cans that includes skin and bones, which you can easily get from OneStopPaleoShop.com or ThriveMarket.com. Also, you might be interested in these articles: The Importance of Fish in Our Diets, The Mercury Content of Seafood: Should we worry? and Should We Be Worried About Radiation from Fukushima? 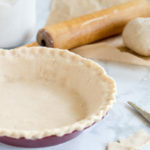 Prepare Perfect Pie Crust (AIP). Keep dough in the fridge until you're ready to roll it out. Peel plantains and cut into 1" chunks. Bring broth to a rolling simmer in a medium saucepot over medium-high heat. Add plantain and simmer, uncovered, until plantain is soft, about 15 minutes. Meanwhile, heat olive oil over medium heat in a small frying pan. Add onion and cook, stirring relatively frequently, until browned, about 8 minutes. Remove plantains from heat and drain but reserve the liquid! Mash by hand with a sturdy fork or potato masher, adding back in broth until you have a thick mashed potato texture (I typically add back in all but 1/2 cup of broth). Add salt to plantains. Taste and adjust seasoning if needed. Add savory and minced garlic. Drain both cans of salmon. With a fork, incorporate into the plantain mixture. You want to have chunks of salmon and plantain and not make it too smooth in texture. Prepare your dish. If making a meat pie, use a 9" deep dish pie plate. If making a pot pie, an 8" or 9" casserole dish works well. Roll out pie crust. If making a meat pie, lay a bottom layer in the bottom of pie plate. Add salmon mixture to your dish, spreading out to evenly fill the dish. Gently layer pie crust over the top. 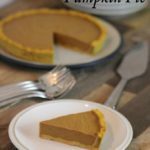 Go ahead and get fancy with some crimped edges and using any extra pie crust to make fun shapes to layer on the top. Also, make sure to cut a couple of slits into the crust for venting. Bake for 45 minutes, until crust is starting to brown. Remove from oven and serve! Is the prep time: 20 hours a typo?